New Gastro Pub to the Pub Street – Russh, Church Street, Bengaluru. After Indiranagar and Koramangala, it is the Church Street, which is booming in Bangalore. This used to be a hub from early 90’s for some of the premium restaurants and pubs in Bangalore. There does still exist many legendary places here, those are incredible till date. Among them though many were opened and closed. Well, I would like to talk about a newly opened Gastro pub “Russh”. Yes, it’s a newbie in the Pub Street of Bangalore and located in ground floor beside Bheema’s restaurant in Church Street. When we talk about Gastro pubs in Bangalore, it’s very less and there are very few which are serving high quality and tasty food. Being a foodie, my preference is more of a good food than drinks. I love to explore and eager to visit if any new pub or restaurant is open in the town. This time I visited “Russh” and I was overwhelmed. The first thing attracted me was Décor. The Russh has ultramodern and classy rustic décor. The place is huge with multiple type of seating like comfortable lounge seats, couple tables and high tables. One can choose based on the mood. They have outdoor dining too, which is more like a portico. The Bar counter is colossal, that attracts everyone indeed! The Gastro Pub is something which should serve good and high quality food, Russh fulfills this to the optimum as it scores high for the quality, taste and portions. Veg Sheek Kebab – The kebabs had great texture, tasty and totally adored with mango mint chutney. The usual kebabs are dry but here, the dish has slender moist and it just melted in my mouth. Paneer Tikka – I hate Paneer Tikka nowadays. Here it’s unique when it comes to taste! The masala used for marinating is different I guess. I never tasted such a good Paneer tikka anywhere. I found the Paneer to be little hard. Chili Cheese Pao – Do you like spicy food? If yes, without second thought order this starter without miss. The Pav Breads are soft and spongy! The dish was presented nicely on a wax paper in a serving bowl and the portions were really huge. Spinach Corn Croquette – I am sure everyone will love spinach and corn. If cheese added to these two, that’s called heavenly. Well, Spinach Corn Croquettes are must try vegetarian starter in Russh. It’s a deep fried dish filled with all three ingredients! Baked Cream Cheese Mushrooms – Anytime I love soft mushroom starters. So that’s a reason I ordered this dish and its one of the signature dishes in the menu. Mushrooms filled with Cheese and wrapped by a baked cream. It just melts and you don’t wait to grab the second. Paneer Kurkure – I had this dish earlier in one of the restaurants in Chikmagalur, they used regular papad coated to Paneer. In Russh, they used spring onions to wrap a Paneer and deep fried. It was served with Garlic Mayo and tasted heavenly. Veg Burger – Burger Bun was soft and Patty was juicy. However, I felt little spice level could have done better. Crispy French Fries served along with this Burger. 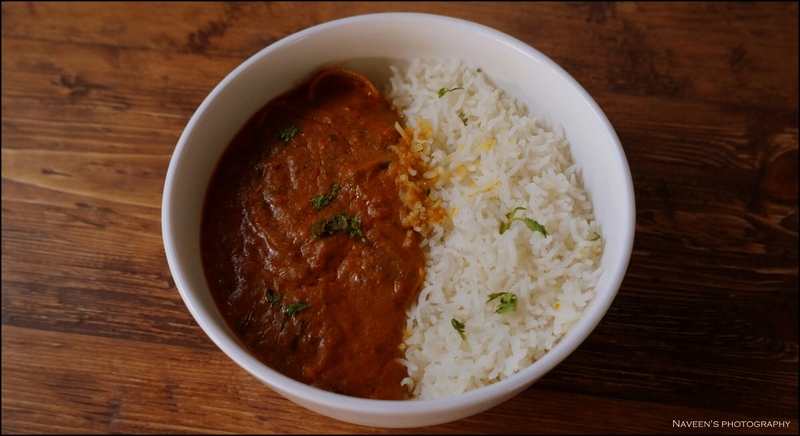 Paneer Tawa Masala with Rice – I liked the presentation and concept of serving both Rice & gravy in the same bowl without mixing. The gravy was flavorsome and perfectly made with all the spices. I personally recommend this dish! Iced Tea – It was truly refreshing and upright. An apt drink to beat the summer heat! The folks at Russh are very quick in serving your order; we got an indeed great service. We were totally impressed with the way they responded and served. The prices are reasonable and portions are more compare to similar places in the Vicinity, that’s something commendable. I will visit soon and try out few cocktails, since I heard lot about it. I just loved the place and will definitely recommend this place to every one! Now it’s your turn! Rush to Russh and let me know your experience in the comments section. Address: 29, Church Street, Bangalore. Previous Post New Pizza Restaurant in Koramangala – Whooppeezz! Next Post A Luxury Lunch at Ssaffron, Shangri-La Hotel, Palace Road, Bengaluru.